New York: Folk and tribal arts are relatively less exposed forms of narrative Indian art and contain within them a gamut of styles originating from various geographical regions in India; Gond art is one such art form. The term Gond art refers to paintings that emerge from a heterogeneous tribal group called the Gond or Koiture, mostly centered in Madhya Pradesh. 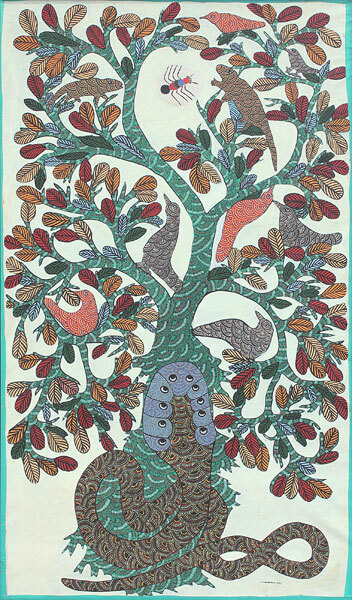 Even within the phrase Gond art there is a wide spectrum of artistic styles, primarily connected to distinct painters and their practices. The Indira Gandhi National Centre for the Arts’s (IGNCA) research discusses the cultural roots of the Gonds and also indicates the unifying theme in Gond art – the pervasive presence of nature. Their pantheon of gods are intimately connected to nature and their strong tradition of oral narrative seemingly transfers to their paintings as well. The first Gond artist to gain national recognition was Jangarh Singh Shyam (who died in 2001), and in fact, the present genre of Gond painting is called Janagarh Kalam after his pioneering style. He was discovered in the 1980s by the late Jagdish Swaminathan, then Director of Bharat Bhawan in Bhopal. Jangarh Singh Shyam was the first artist to paint on paper and canvas instead of directly on earth or walls of the home. 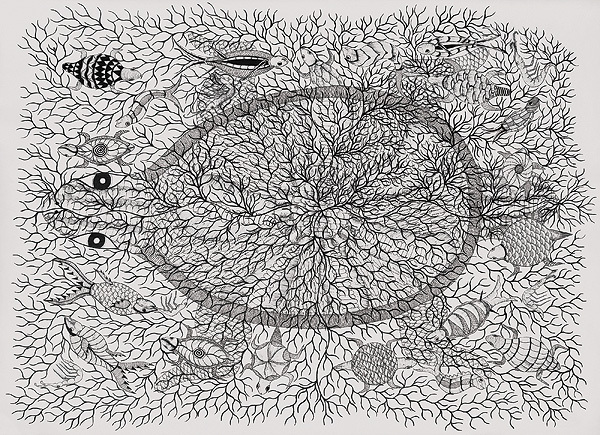 The intricacy and control in his dot-based designs is seen in the works of all Gond artists, as are his most common subjects – the tree of life and various animals. 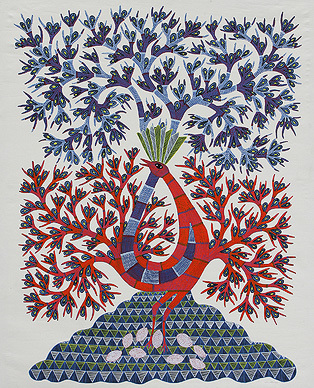 The tree of life is also a favourite subject of Ram Singh Urveti and Suresh Kumar Dhruve. Ram Singh Urveti uses a deep colour palette and combines his imagery of trees with a variety of animals, creating a synergy of plants and animals in his work, while Suresh Kumar Dhruve often presents trees almost like a totem pole, erect and still, surrounded by human figures. Jangarh Singh Shyam’s wife Nankusia Shyam and daughter Japani Shyam are also renowned Gond artists. Their paintings are inhabited by the world of animals, although their individual aesthetics are distinct. Nankusia Shyam often paints animals from her childhood memories or shares her impression of urban culture in the shape of these animals. Japani Shyam, on the other hand, almost seems to capture the eco systems in which animals survive; her works are denser, they are reproductions of the worlds that animals and plants survive in. In Narmada Prasad Tekam’s painting, plants and animals share equal footing; they are not shown as a continuum, as in Jangarh Singh Shyam or Ram Singh Urveti’s work. These detailed works contain everyday creatures, recognizable in their presence. 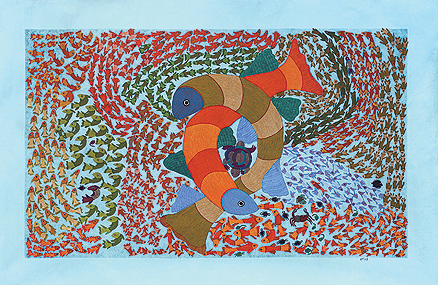 Durga Bai’s works, which have been widely exhibited in India and abroad, show a dynamism and movement within the picture that is unique to her. Brightly hued, hers are narratives of folk tales and deities, of goddesses remembered. 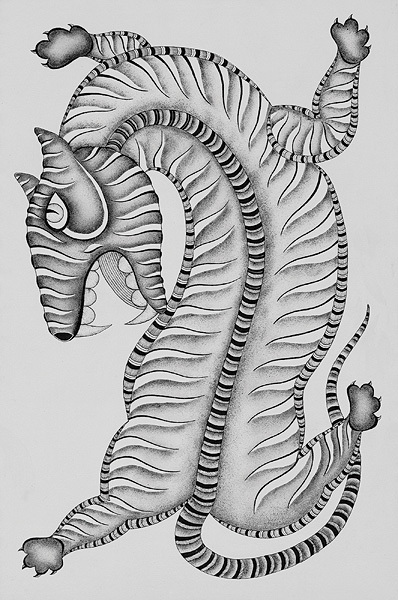 Dhavat Singh’s Tiger Tales are vivid representations of tigers, their interactions with their surroundings and the folklore that surrounds these majestic animals. Equal parts contemporary and traditional; these are visceral works, extending the parameters of Gond art, as it stands today. 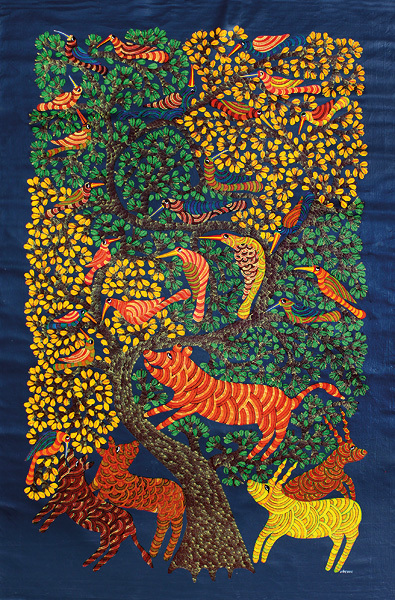 The story telling, the fantastical animals and trees is a thread that runs through the work of Gond artists, rooted in their folk tales and culture. However, each of these artists, as evident in these images, has developed a specific language within these narratives creating a richness of aesthetic forms and styles. These artists represent only a fraction of practitioners of Gond art. A more extensive list and information is at the IGNCA website.